Pricing and release info yet to be revealed. 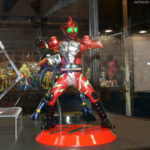 I wish the SHF could catch the look of the suit as well as this does. And no, it's not because of the joints. That's a beautiful figure! I tremble in fear of the day they reveal a Baron to go with my Gaim, though. Apply ketchup for dramatic effect. That looks nice. I'm surprised Omega didn't get one also. Good bye wallet: I barely knew ye. I think these always look better to some/most people because they have cloth over the frames. At least I think it's cloth, or at the very least some form of fabric. But the point is, they look more show accurate than SHF because of that, and because you can't see the joint. It has nothing to do with the joints being hidden with rubber and cloth. The overall figures looks miles better, much more so than if you would compare the SHF of Drive, Gaim or even Ghost to their RAH counterparts IMO. Something about the Amazon Alpha SHF just doesn't look right to me, don’t know why. Maybe it’s the headsculpt. I was agreeing with what you said about them looking better. Then I have my speculation/opinion as to why. Also, notice how I didn't highlight your comment about the joints? I made the comments about not seeing the joint because I wanted to. Because I think that way.